Last February I reviewed Anthony DeStefano's book This Little Prayer of Mine. It instantly became a family favorite that we read every night (I can now recite it without glancing at the words on the page). 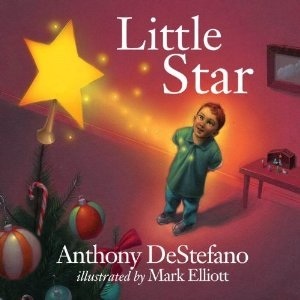 So I was thrilled when I got the chance to review a copy of Anthony's new Christmas children's book, Little Star. I will give my thoughts on Little Star in a moment: but first I will give you the review that truly matters... Sadie's. Sadie is passionate about books, in a typical two-year old sort of way. She loves the books that she loves and she can not stand to look at the books that she doesn't love and will take them from my hand and toss them back towards the shelf (we talk about being nice to books a lot). And the books that are on her favorites list, may not stay there for long (she went from being in love with "Are You My Mother" to crying when she saw it on the bookshelf all in one week). So when I introduce a new book I never know what the outcome will be. Little Star passed the Sadie test with flying colors. She sits and listens to it. She even went over and went through the books on the shelf and found it and brought it to me so that I would read it to her. It has become a holiday (and I have a feeling year round) favorite. Little Star's story is one of sacrifice. It begins with a father telling his son the story of the Christmas star, which shown so brightly in the sky above Bethlehem on the night that Jesus was born. Little Star, as you can probably tell by his name, was not the biggest or the brightest of the stars in the sky, and was ignored by everyone. However, the fact that he was small helped him to see what the other stars missed on that first Christmas night and led him to make a sacrifice so great that he will never be forgotten and is part of Christmas celebrations to this day. This sweet book with beautiful illustrations is a great addition to any Christmas library!